Alporchinhos is located in the famous region of Algarve, in Portugal, near Porches in the Lagoa council. This area is characterized by its magnificent coastline, for its sunshine and its rich culture. The rocky coast, consisting of secluded coves and small sandy beaches, offers you a great setting to admire from your holiday accommodation in Alporchinhos. 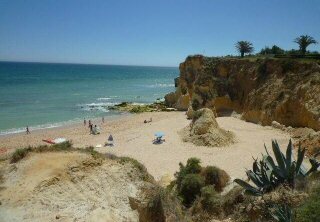 With great location, holiday accommodation Alporchinhoss are an excellent starting point for exploring all that the Algarve has to offer. The beaches of Nossa Senhora da Rocha and Covo Nuova are two of the most beautiful beaches of the Algarve and are very easy access via a tunnel through the cliff. These beaches are ideal to take a quiet walk, but also for water sports such as snorkelling, sailing and deep sea fishing. One of the best ways to discover and explore the diverse coastal strip near Alporchinhos is to rent a boat in Cabo Carvoeiro or Benagil beach, in order to explore the coves and sleepy fishing villages planted along the coast. Main atractions: Beautiful beaches, Sra. da Rocha, Armação de Pera, water sports such as snorkelling, sailing and deep sea fishing.